Diving in West Palm Beach, Pompano Beach, Key Largo and the Florida Springs! This time of year, the water temperature from surface to 100 feet is in the low 80’s and slowly Rising. The visibility on most days is 50 to 60 feet with higher visibility usually in the 80 to 120 foot range after a couple of days of East wind. These days, we start getting east winds that push in the warm and clear Gulf Stream waters. The waves have been, on most days, 2 feet to 3 feet! Be sure to keep your eye on the weather forecast! Winds this time of year change daily. Check the Marine forecast link on the left for the latest updates and remember that these forecasts change every 6 hours. May to September is the time of year that we start seeing the turles, seas horses, frog fish and rays coming through our area. The water is warm in Florida but the dive boat’s are starting to fill up call early to get a seat. Now is the time to dive if you like to hunt for lobster or fish. Give us a call we have several boats that are hunting friendly. You and your dive buddy are all that is missing! Don’t have a dive buddy? You can come dive with one of our Dive Masters or Instructors and we will be your dive buddy for the day and even give you some pointers along the way at no extra cost. Our full-time occupation is Scuba Instruction. Our schedule’s are extremely flexible and can be designed to meet your specific needs. I will reserve a course for you on short notice if possible. Your course may be scheduled on nonconsecutive days, weekdays, weekends and most holidays. You can see what dates are presently available by consulting my training calendar (opens in new window). 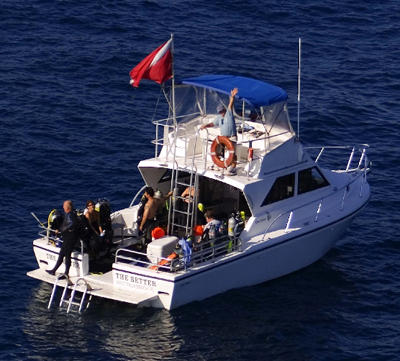 We are now offering dive courses in Technical Nitrox, Decompression, Helitrox, Heliair, Gas Blending, and Wreck Penetration. Have you always wanted to dive the wrecks that you see on TVs Mysteries of the Deep or go hunting for the big ones in deep water safely. How about joining us on a trip to the Spiegel Grove for a wreck penetration to the engine room. After these courses you will be ready to start seeing what only 1/10th of one percent of most divers will ever see. For course scheduling, either call or e-mail me.